As the softness of the rain gentle touched our faces the restaurant beckoned. And from the moment of opening it’s door a cooling freshness and clinically clean ambiance greeted us. Welcome to Pranee Kitchen. 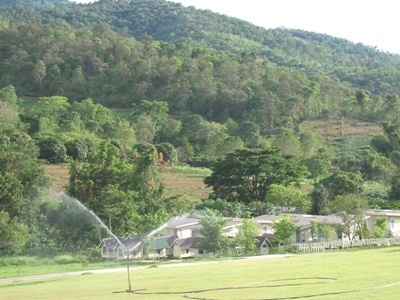 A multitude of Chiang Mai’s population drive to and from the mid and southern Thai provinces several times each year. En-route the question which is always asked is, “where shall we have breakfast, lunch or dinner”, as the case may be. Well at last a small dining jewel has been found, tried twice, and comes recommended. There is a feminine touch to the whole place, a high ceiling pervades a sense of space, whilst the soft blue and cream walled decor provide light and clarity. Seating for 32 guests at 8 tables is available, in air controlled comfort. After selecting a table a friendly waitress presents the so professionally prepared menus, then courteously withdraws. Such an antonym from other dining experiences. A wide variety of both Thai and western culinary dishes are available. My family chose vegetable soup with prawns, stir fried veggies, a glass noodle salad, all with steamed rice and 3 large fresh fruit drinks. For myself I opted for the chicken steak, mashed potatoes and vegetables, followed by home made apple pie and ice cream, a palatable glass of red wine and a coffee. The mutual fulfilment was simply delicious, no other superlatives are necessary. Of course everyone says that their Mum’s apple pie always tasted so yummy, well Pranee’s recipe and presentation is in that same league too. Our bill for 4 adults amounted to less than 600 B, absolute value for money. And yes, we returned from the south one week later, and were not disappointed. For those early birds who enjoy a cooked western meal, the American Breakfast is priced at 59 B. One of my global career habits is to check the “backstamp logos” on ceramic tableware. My courses were served on spotless German porcelain. 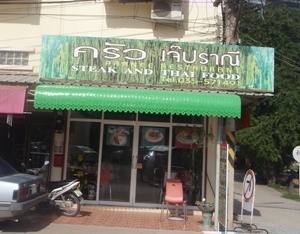 You may be familiar with “Tasty Thai” food outlets both here in Thailand and around the world. Pranee is one of the founders of the “Tasty Thai” franchise. How to get there - From Chiang Mai take route 11 to Lampang, then follow route 1 to Nakhon Sawan and on to Chainat. Change here to route 340 heading due south to the Samchuk traffic light junction, (45kms from Chainat). Turn right, continuing for 500 mts, following signs for the well known 100 years old market. Pranee Kitchen is just before the market, the restaurant has ample adjacent parking. Open 7 days per week, 9am to 9 pm. Tel - 035 571 491. Whilst in the Suphanburi area, the Samchuk market is worth visiting too. It’s stalls sell unusual products, and the Thai deserts made from yesteryear’s recipe are a must. Try the “Khao hor bai bua”, steamed jasmine rice wrapped in a lotus leaf. Vendors have pride in the whole area, it’s walkways cleanliness are a joy for browsing. for Chiang Mai join hands to help draw tourists to the area. In a bid to draw tourists to Chiang Mai’s major attractions during the low rainy season, the Tourism Authority of Thailand (TAT), Chiang Mai Zoo, Zoo Aquarium, Chiang Mai Night Safari and Royal Flora Ratchapruek are offering a special package at the cost of 999 baht for visiting all four destinations TAT’s Chiang Mai office Director Chalermsak Suranant told the Chiang Mai Mail at the end of August. The one day,one night package includes hotel room accommodation, meals and van service and is available until October 31, 2010. Along with visits to the Zoo and the famous Lhin Ping, the Aquarium and its underwater tunnel, night safari tours to view the wildlife in a natural habitat, there is a trip to Doi Suthep and out to the Royal Flora Ratchapruek to experience the lush gardens there. Roj Thuwanasin, Chairman of Chiang Mai Zoo Aquarium said, “We would like to promote these tourist attractions, offering the three zoos and one garden in a single package. This is the first package of the year but we expect to offer more later,” he said. He noted that this month, the Zoo Aquarium will be offering viewers more colorful shows with a light and sound presentation with special underwater dancing. Mrs. Tassanee Srimongkol, Director of Royal Floral Ratchapruek noted the many attractions of the Royal Park and the upcoming Royal Flora Expo. 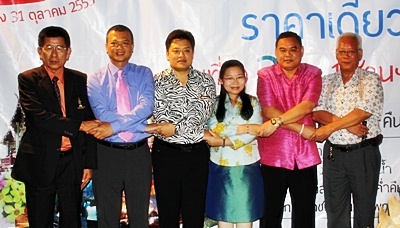 Chalermsak concluded hoping that the package will attract tourists to the many interests in Chiang Mai, noting that brochures will be distributed to 26 TAT offices nationwide. Finally, he reminded everyone of the tourism road shows that visisted the five regions of Thailand in a bid to increase domestic tourism. The Middle Way, an international Meditation Retreat Program, has opened at Suan Pa Himmawan, Phu Ruea district, Loei province, Thailand. For more than four years, instructors of The Middle Way have travelled to teach meditation in many countries throughout the world. The Middle Way also has branch retreat centers in Europe, Asia, America, Australia and Africa . Since the meditation courses began in 2006, people from more than seventy countries have travelled to Thailand, which is The Middle Way’s hub. The Middle Way was voted one of the world’s ten best retreat centers and it was the only one from Thailand to be selected by ‘Travel &Leisure’, the number one travel website and magazine in the United States. The increased acceptance of people from all over the world reflects the capacity of The Middle Way meditation retreat program to connect with international people and to raise the profile of meditation tourism in Thailand. The Middle Way is now starting meditation courses for international executives. These courses will be conducted by both western teaching monks and thai teaching monks, who are fluent in English and have over ten years experience teaching meditation to international practitioners. Companies that are interested in holding meditation courses for their executives or staff, as well as international individuals interested in learning meditation can visit www.meditationthai.org for more details or call (+66) 82-3333-082.